Thank you to Gorton’s Seafood for sponsoring this post! Which is why when the warm weather months are here, we live (and eat) to the fullest. 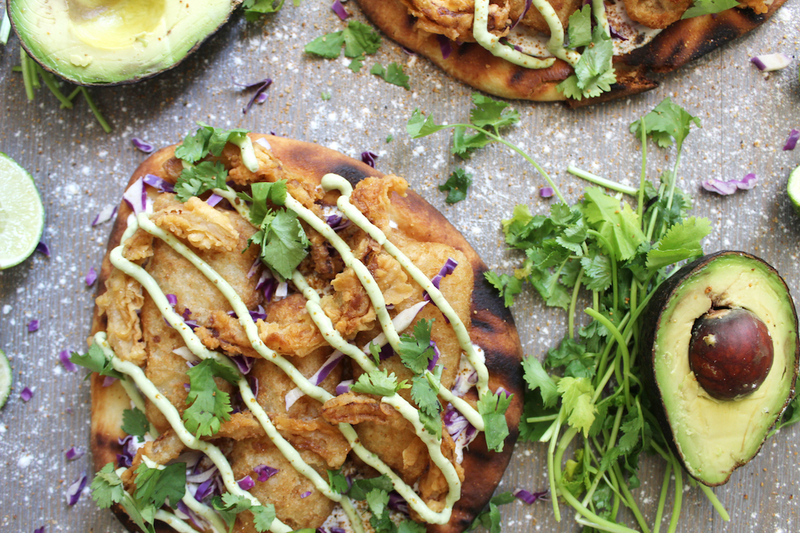 For our family, summertime means grilling pizza, and making delicious tacos. 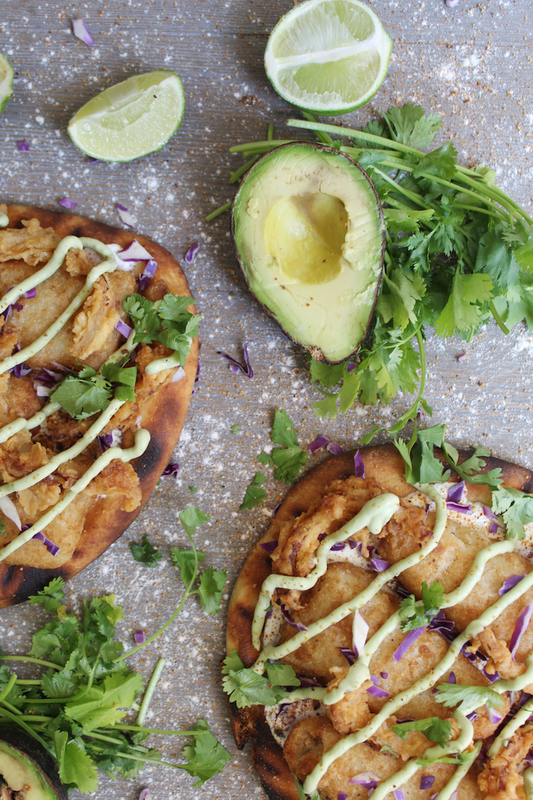 We make tacos of all shapes and sizes, filled with just about anything you could image – yet there is nothing like a flaky, crunchy fried fish taco! And being from New England, we tend to be a bit snobbish about our fish. 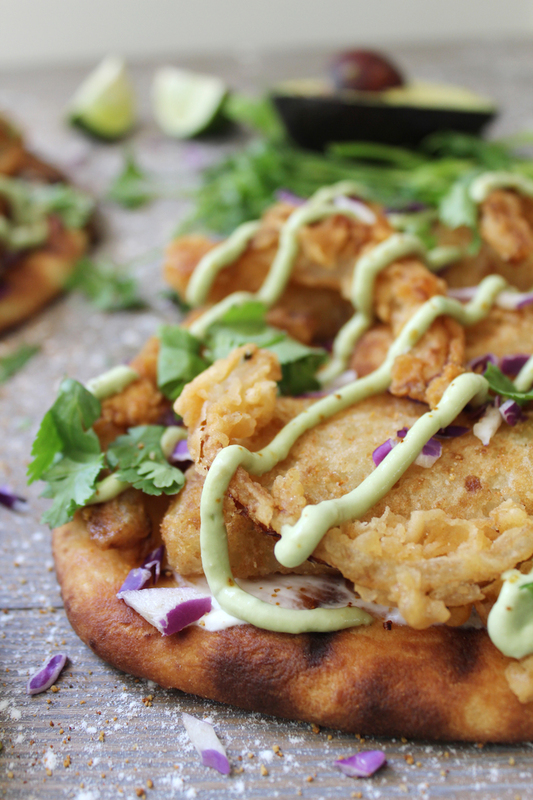 With such good access to the ocean, we know what good seafood tastes like. But we also know what it feels like in our wallets. 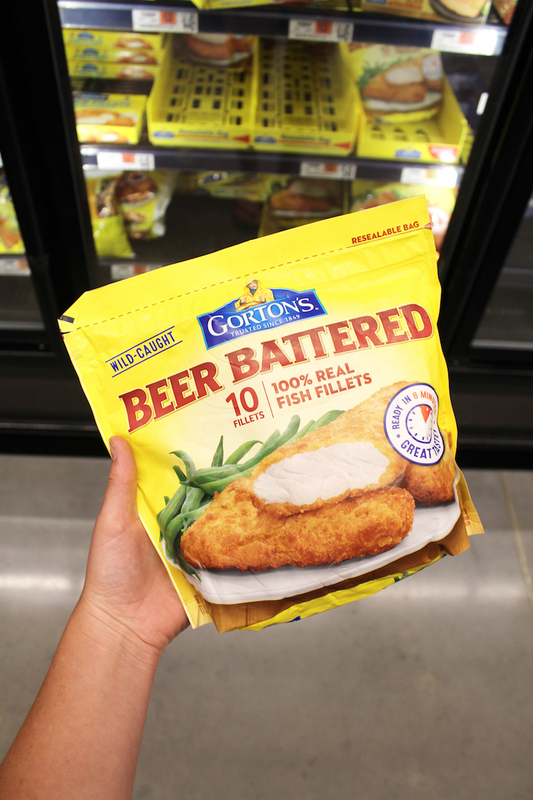 That moist flaky fish we crave does not come cheap, so when we discovered Gorton’s Beer Battered Fish Fillets, we knew we had to start whipping up some new fish dishes pronto! 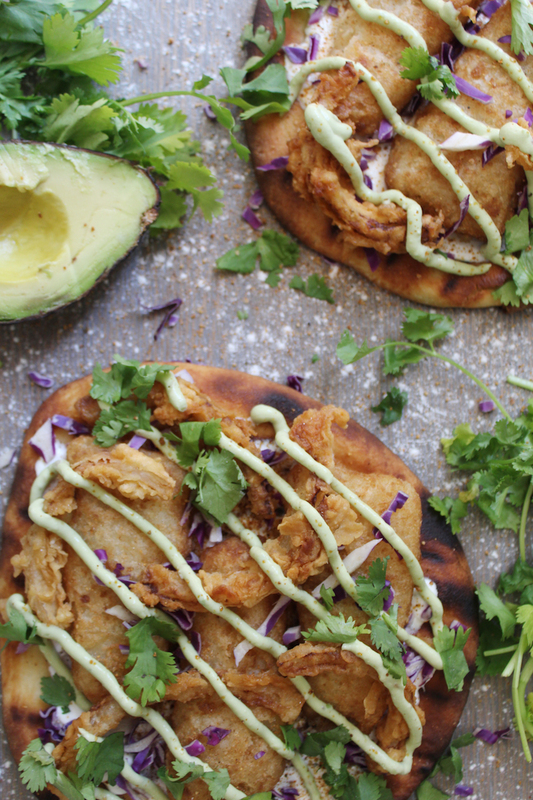 Whenever we are feeling less-than-inspired during our meal planning, we will attempt to fuse together two separate recipes that we love for new inspiration. 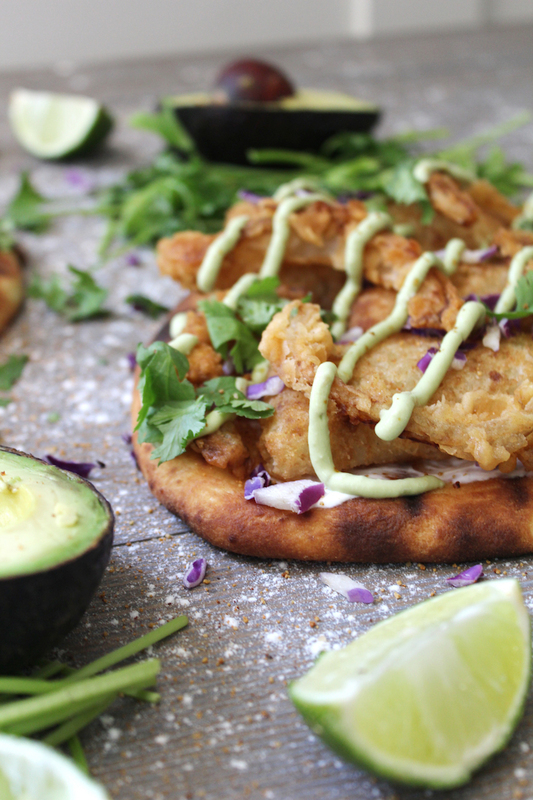 Thus, the Fish Taco Flatbread was born! 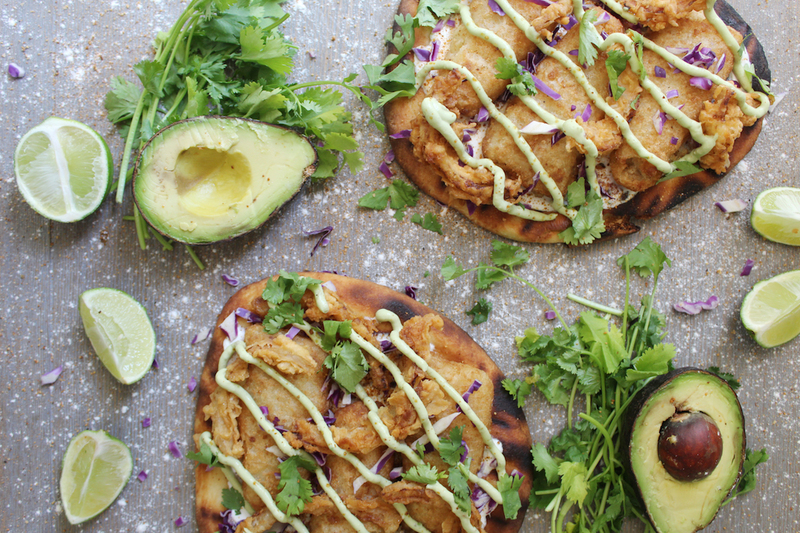 We don’t have as much time on our hands as we did pre-children, so we don’t want to waste time making our own flatbread dough when there is perfectly tasty and well portioned naan available to us at the grocery store. It crisps up nicely and provides the perfect base for this dish. 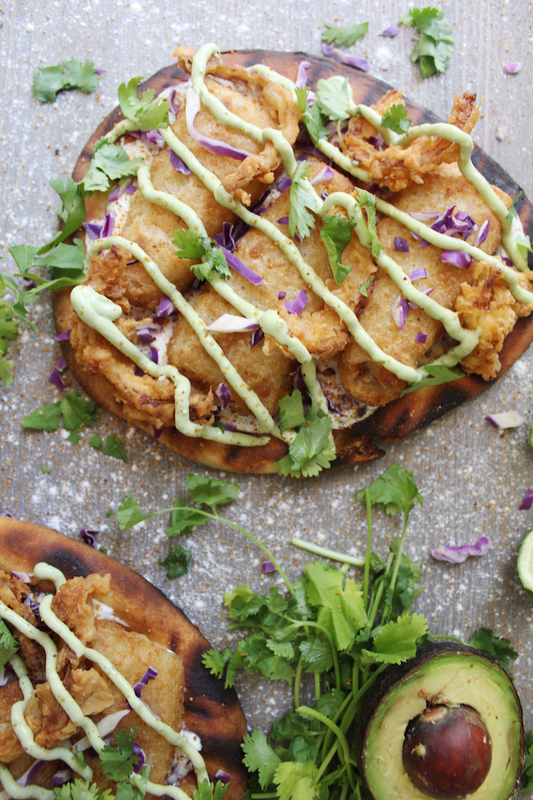 Atop the naan, we smear a light base of sour cream, followed by the star of the dish, Gorton’s Beer Battered Fish Fillets! 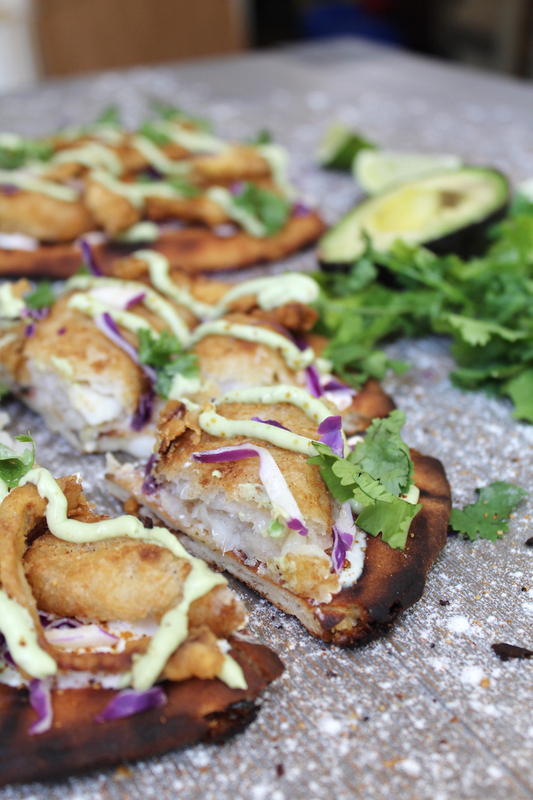 After that, we added all the toppings you would find in one of our fish tacos: fresh cilantro, crispy fried onions, chopped red cabbage, our avocado / sour cream sauce drizzle, a dusting of creole seasoning for a little kick, and some lime wedges for a pop of acidity. 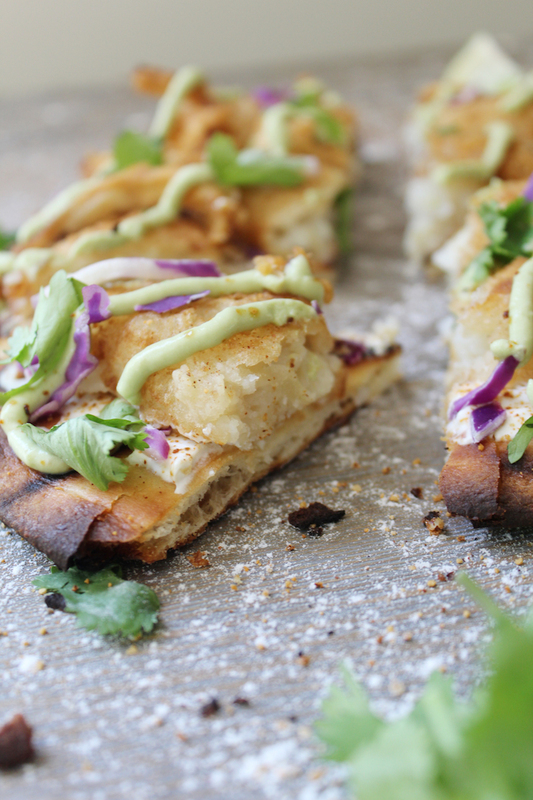 It was great to mix up a fish taco into a flatbread. It is the perfect size to have one to yourself, or to slice up a few and serve as a go-to appetizer. 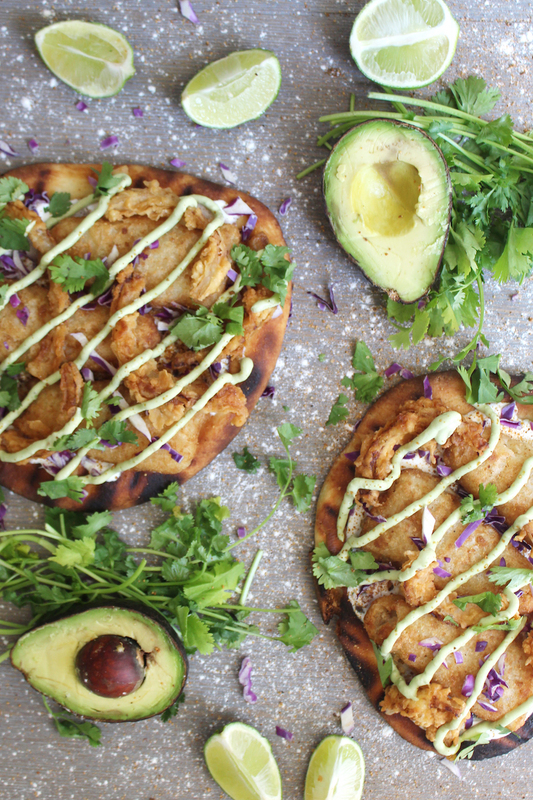 The heat of the spice, the crispy battered fish, the creaminess of the avocado, will put this on our summer recipe list for years to come! 1. 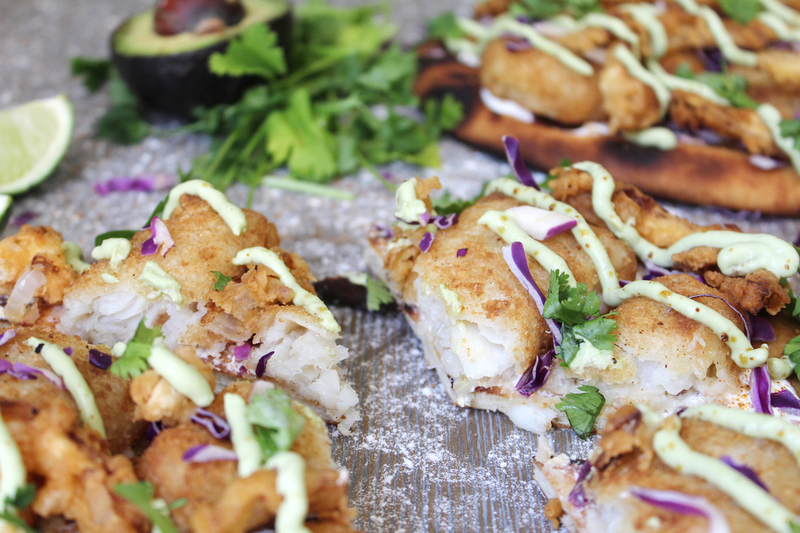 Follow the instructions to cook the most delicious Gorton’s Beer Battered Fish Fillets in the oven. 3. In a bowl, mash up 1 avocado, and then add 1 cup sour cream and whisk well until there are no lumps. 4. Now time to make the fried onions! Cut the onions to your liking. And prepare a bowl with a whisked egg, and a plate of all purpose flour. Heat up olive oil in a frying pan over medium-high heat, dip onion into the egg, and then into the flour, and then place in the hot olive oil for 1 minute, or until golden brown. 5. Assembly time! 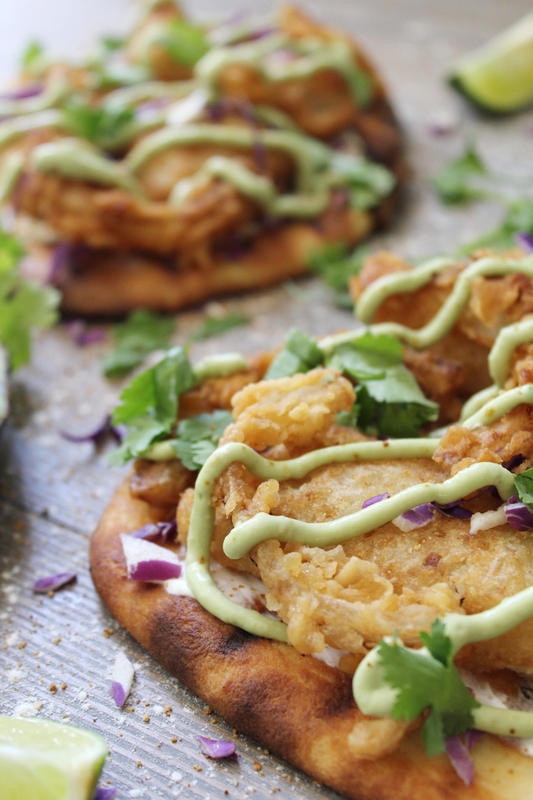 On the naan flatbread, scoop 1/4 cup of sour cream and spread all over. 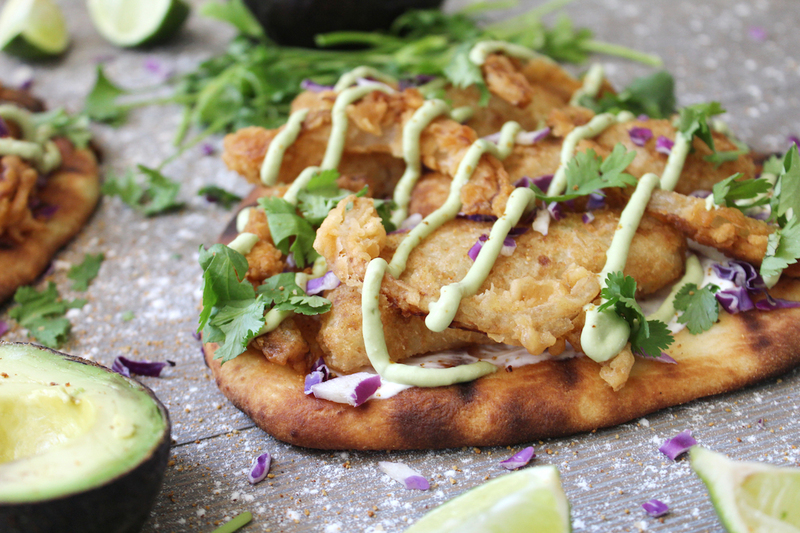 Then, pace the Gorton’s Beer Battered Fish Fillets down, followed by a handful of cilantro, red cabbage, the sour cream / avocado spread, a sprinkle of creole seasoning, and some freshly squeezed lime to top it all off.